the academic capital of the country, and it is quite natural that the Kazan Branch of the Academy of Sciences of the USSR was organized on April 13, 1945 by the Resolution no. 745 of the Council of People's Commissars of the USSR. The high scientific authority of A. E. Arbuzov, the first Academician in the Tatarstan Republic, in many respects promoted the realization of that project. The Presidium of the Academy of sciences of the USSR approved the structure of new branch with Chemical Institute as its part on August 25, 1945. 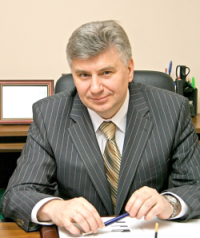 Academician A. E. Arbuzov was appointed the chairman of the Presidium of Kazan branch of the Academy of Sciences and Director of the Institute. This is the starting point of the history of our Institute. synthetic fibres, plastics and other synthetic materials” was taken. In response to it the Presidium of the Academy of Sciences of the USSR adopted the resolution from December 12, 1958 on the organization of the Institute of organic chemistry, the second Academic Institute in Kazan, Academician B. A. Arbuzov was designated the director. The construction of the building for the newly organized Institute started in 1959. The place was chosen at the city suburb of those days – the Neftyanikov street (since 1970 – the academician A. E. Arbuzov street). Deputy directors I. M. Marinin and K. V. Nikonorov contributed greatly to this construction work. On February 5, 1965 the Presidium of the Academy of sciences of the USSR merged the A. E. Arbuzov Chemistry Institute and the Institute of Organic Chemistry of the Academy of Sciences of the USSR in Kazan into the single A. E. Arbuzov Institute of Organic and Physical Chemistry of the Academy of Sciences of the USSR (IOPC). The Academician B. A. Arbuzov was appointed the director of the new institute. At that time the institute staff was 480 persons. nature, allowing one to understand the properties and behavior of the substances in the reactions, was performed. The other specific feature of the Institute was its orientation at the search for new biologically active compounds, aimed mainly at the obtaining of new effective medical preparations. During decades the structure of the Institute, staff and number of the laboratories changed, the research areas developed. After B. A. Arbuzov, since 1971 the Institute was headed by outstanding Kazan chemists A. N. Pudovik (the B. A. Arbuzov’s disciple), A. N. Vereschagin (the B. A. Arbuzov’s disciple), E. S. Batyeva (the A. N. Pudovik’s disciple), A. I. Konovalov (the B. A. Arbuzov’s disciple). organoelement compounds, mainly phosphorus derivatives, were developed.